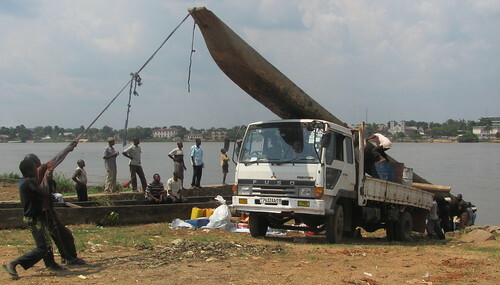 Taking a dugout in a truck from one port to another is sort of like carrying a heaving carp in a wagon from one pond to another pond. In the truck the dugout is a convincing “fish out of water”. 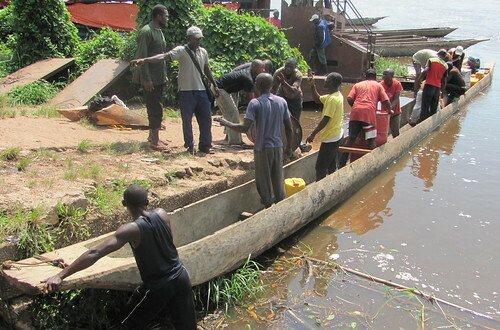 Nevertheless, Sabin, our helmsman, assured me this was the least expensive and safest way to get a top-quality dugout from the downstream port of Kisangani, around the rapids, to the upsteam port of Ubundu. 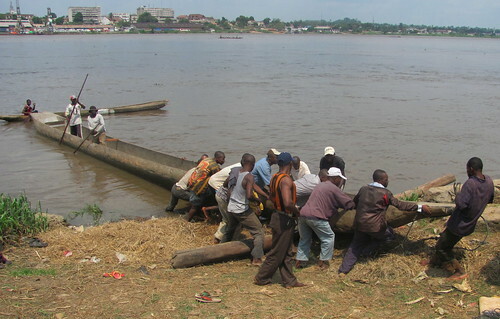 Like so many other things in DRCongo – the process was completely dependent on human might and mane. There was no operational crane, no hoist, just brawn. This is a photo documentary. and finally shifting the weight. The truck rolled slowly to Ubundu. Alas a last jolt in a pothole dislocated a bit of the stern. 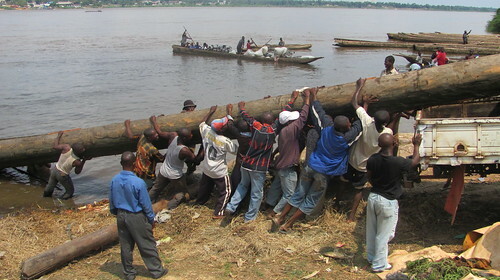 But Sabin put in at Ubundu, it was floating with the hole well above water. 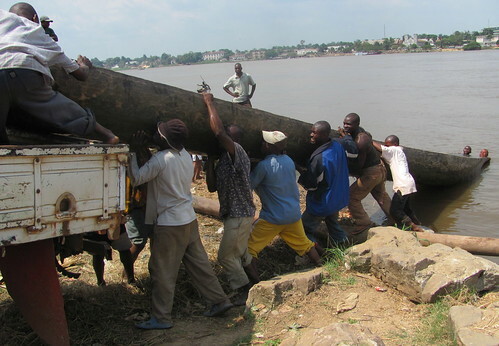 Ubundu’s stevedores loading the dugout. 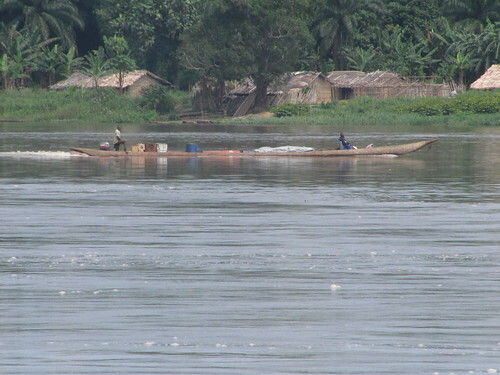 Sabin heading south, upstream to Kindu in three and a half days. 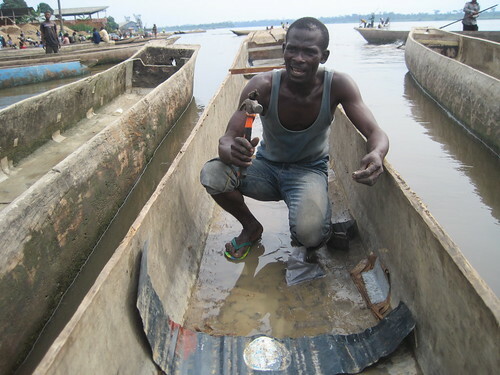 In Kindu’s port a local dugout repairman fixes the stern (see crack in back) with leaves, tin and tar. 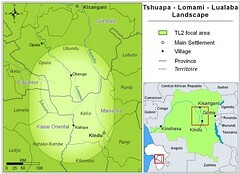 This entry was written by Terese Hart, posted on 2011-02-21 at 7:13 am, filed under About the project, Kindu, Kisangani. Bookmark the permalink. Follow any comments here with the RSS feed for this post. Post a comment or leave a trackback: Trackback URL. As always, Terry, I am in awe of all you and your team accomplish! I never imagined the dugouts were so large. Am wondering how it would fit in our pond! the ethnic groups most attached to the river (fishermen, farmers on the banks), are swimmers. In the cities however people come from all over and have need to travel and cross back and forth. Never having played in the water as children…. As always,I love seeing the pictures,even if they are a few years old,reading the blogs and finally,sending on some dough, as I can.